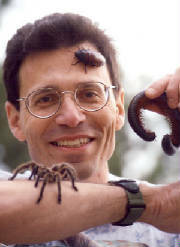 Since 1997, wildlife educator and naturalist Mark Carra, has entertained and educated over 200,000 amazed listeners with some of the most spectacular animals imaginable! Each year Mark averages roughly 300 speeches and has been a regular speaker at the Canisius College Biology Department in Buffalo NY. Mark has exceptional qualifications and an incredible resume! He has spent more than 18 years total as an wildlife educator, researcher and handler, speaking to over 100,000 people in the past three years alone. He demostrates a incredible passion for wildlife and nature and has a amazing ability to share that passion with others. For the past 11 years, Mark has shared his experience with Wildlife Encounters Zoological Outreach. As an educator Mark has spoken for Animal Planet / Discovery Network and National Geographic in various cities around the eastern United States. As an handler, Mark has also worked with such celebrities as Steve Irwin "The Crocodile Hunter," Terri and Bindi Irwin, Jeff Corwin, Austin Stevens "The Snakemaster," Jack Hannah, Jim Fowler and Peter Gross from Mutual Of Omaha's Wild Kingdom, Chris and Martin Kratt (Zoboomafoo), Ruud Kleinpaste " The Bugman," Mo Rocca, Dr. Kevin Fitzgerald and Dr. Holly Knor of Emergency Vets just to name a few! In 2003 Mark served on the board of directors for the Buffalo Audubon Society and is currently the Executive Director of The Charles E. Burchfield Nature & Art Center in West Seneca, New York. Mark is a member of The National Audubon Society, The Nature Conservancy, The Cousteau Society, The Cornell Laboratory of Ornithology, The National Wildlife Federation as well as The World Wildlife Fund. He is known for his creative antics and his unparalleled love and respect for the earth and the creatures that live among us!